You are browsing the archive for RPF News. 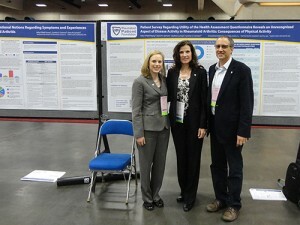 The Rheumatoid Patient Foundation has completed its second year offering the RPF Scholarship Program. This program offers students who have rheumatoid disease or who have a parent with rheumatoid disease the opportunity to get some financial assistance as they pursue higher education. This year's program offered up two $1,000 scholarship awards. We had an overwhelming response with more than double the number of applicants this year as last -- which underscores the need for this sort of program. The scholarship program required applicants to submit a written response to several essay prompts. We had many excellent submissions and would like to say thank you to all who took the time to apply for this scholarship program. We wish you all the very best in your higher education and vocational pursuits. 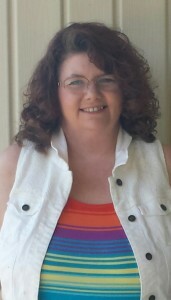 Kristine was diagnosed with rheumatoid arthritis in 2008. 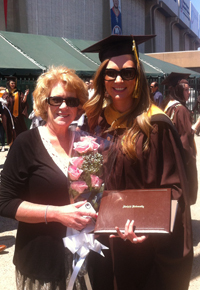 Since then, she has earned a Master’s degree in occupational therapy and is now pursuing a PhD with a focus on the quality of life of young adults diagnosed with rheumatoid disease. "I am so humbled by the work of organizations like Rheumatoid Patient Foundation that are so dedicated to advocating for people like me. Together, we can take down the barriers of disease to build the brightest of futures for our community!" 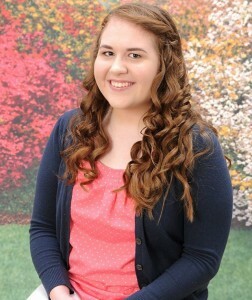 Ariella Phillipo grew up in Upstate New York. She was diagnosed with Polyarticular Juvenile Rheumatoid Arthritis (JRA) at seventeen months of age, and later developed Anterior Uveitis at the age of two. She has battled with her rheumatoid arthritis her entire life, but refuses to let it hold her back from a successful education and career. 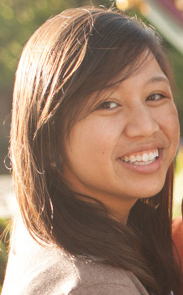 She is currently studying advertising and public relations with a 4.0 GPA at Columbia College Chicago in Chicago, IL. 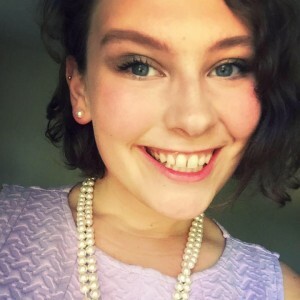 She hopes to peruse a career in pharmaceutical advertising and strives to create transparent messages that inform and engage audiences within the medical community. Congratulations to you both! For more information on the RPF Scholarship Program and for information any any future award opportunities, please click here. Click here to view our 2015 Scholarship Winners. RPF is excited to announce the two winners of our very first scholarship program: Amanda Jones of Montgomery, Alabama and Melissa Eller of Hickory, North Carolina. Congratulations! We had many excellent entries and we want to thank everyone who took the time to submit an application and essay. We wish you all the best in your educational and vocational pursuits. If you are a higher education student (or will be next year), we encourage you to keep an eye out for this year's Scholarship Program to be announced later in 2015. Here's are a few highlights about our winners. Mandy was diagnosed with Rheumatoid Disease in 2012. She is currently a senior in high school and is in the process of selecting the university that she will be attending in the fall. "I am pursuing my dreams to become a biomedical engineer. I have been accepted to Saint Louis University, University of Alabama-Birmingham, and The University of Tennessee, with scholarship to all three. Take that, RA!" Melissa was diagnosed with Rheumatoid Disease when she was in her thirties and has been living with RD for over six years. 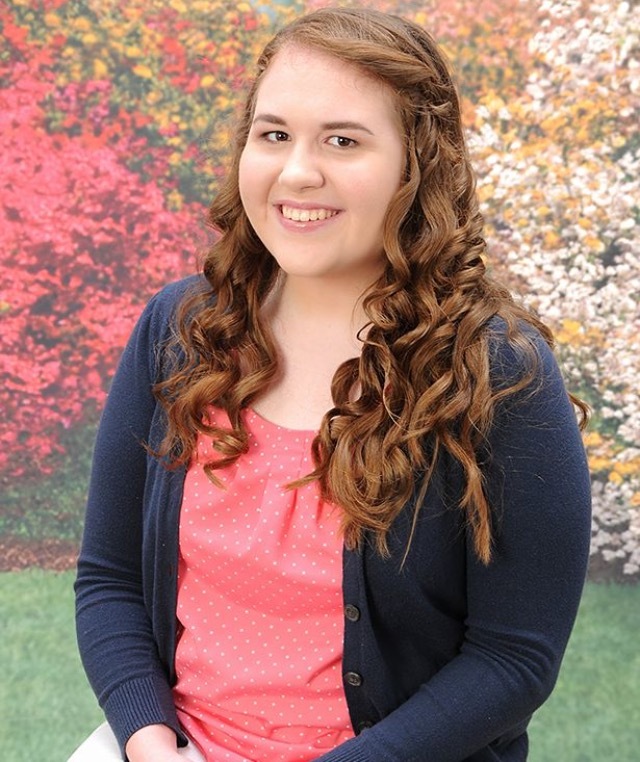 She currently works as an Activities Coordinator at an assisted living facility and is pursuing continuing education at her local community college. "I wanted to express my gratitude to you all for this opportunity. I had given up hope on ever being able to become an event planner but now thanks to this scholarship I can say that my dream job is with in reach now!" RPF is excited to announce a new scholarship program for individuals and families who are affected by Rheumatoid Disease. In our first year, we will be offering two $1,000 scholarships toward higher education expenses, to be awarded to individuals living with RD or who have a parent with RD. We recognize the financial strain that rheumatoid arthritis can place on a family and the career challenges many people with rheumatoid disease face. In light of that, we are happy to be able to offer some support to those looking to advance their education and/or change careers. Scholarship applicants will be required to submit a short essay answering questions about their experience with rheumatoid disease and how it has affected their lives. All essay submissions will be judged based on content and quality, and two winners will be selected. The scholarship deadline for this year is December 31st, 2014. Winners will be selected and scholarships will be awarded in 2015. Click here for more information on the 2014 Scholarship Program or to submit your application. Rheumatoid Patient Foundation is excited to announce a collaboration with ContextMedia, Inc. The ContextMedia:Health Network offers a patient education TV network to doctors' offices across the country, including about 600 rheumatology offices. 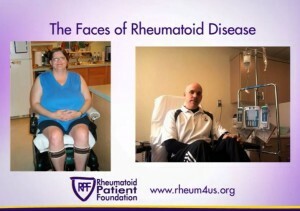 RPF's very own Faces of Rheumatoid Disease video will be running across the ContextMedia:Health rheumatology network. Additionally, RPF has collaborated with ContextMedia, Inc. to produce a series of videos focused on the individual stories of people with Rheumatoid Disease. The first of these videos will run this month. RPF will also provide educational materials to rheumatology offices in the ContextMedia:Health Network. We will be distributing several of our brochures to participating offices. Individuals and health professionals can also request copies of our educational materials directly from our website. Our hope is to provide educational resources that are easy to understand and to provide encouragement and support to others with rheumatoid disease during their time spent in doctors' waiting rooms. Rheumatoid disease can be confusing and isolating; and sometimes just hearing from another voice who understands can provide hope. Want to share your story? We'd love to feature you on our blog! Click here to email us and we'll provide some parameters to help put your story together and share your experience with Rheumatoid Disease. RPF member Andrew Lumpe describes a few highlights from the recent American College of Rheumatology (ACR) annual meeting in San Diego. Andrew is a professor at Seattle Pacific University and a talented statistician who coauthored one of RPF’s recent abstracts published at ACR. I was privileged to spend three wonderful days at the ACR scientific meeting in San Diego. The highlight was a research paper (poster) that a team from RPF presented. The goal of this study was to obtain greater understanding of the nature of RA as experienced by patients. This study involved a patient survey that contained some questions related to consequences of performing certain physical tasks and whether a recovery period followed. The results of this study suggest an aspect of disease impact on physical functional that is not detected by a common assessment tool used by doctors and researchers, the “HAQ.” Several results of this survey indicate the existence of a “recovery period” after physical activity in people living with rheumatoid disease (RD). The survey data also indicate that patients modify activity to manage consequences of RD. Further investigation is needed to develop ways for patient outcome measures to more accurately assess rheumatoid disease activity. It was exciting to participate in patient-driven research about RD and the goal is that such efforts will continue to inform clinicians and researchers so that diagnosis and treatment will improve. In addition to the research paper presentation, I spent time volunteering at the RPF exhibit where I was able to meet other wonderful volunteers and speak to doctors and researchers about the patient perspective and the goals of the RPF. In between shifts working at the exhibit, I attended several excellent sessions and browsed the poster presentations. Below are several keys ideas I gleaned from the conference. The information age stands to completely transform medicine and drug development. There is a “patent cliff” coming soon where many current pharmaceutical companies will loose patents on drugs. The question remains about who will develop new drugs after this happens. Huge online databases may be able to help identify genes connected to diseases (diagnostics) and be used to develop new drugs (therapeutics). Patient self-assessments of RA symptoms align with rheumatologist assessments about 50-70% of the time. Questions remain about where they disagree. There are several new RA drugs in phase III clinical trials that may make it to market soon. The exhibit hall was overwhelming and pharmaceutical companies who sell popular biological medicines spend vast amounts of money on marketing at ACR. Personalized medicine based on genomics and autoantibody profiles may be in the future. Biomarkers for various signaling pathways may be used in future drug development. Autoimmune antibody markers other than Rheumatoid factor (RF) and anti-CCP are being investigated in order to better predict Rheumatoid Arthritis diagnosis. People with positive RF and Anti-CCP tests tend to have higher levels of inflammatory cytokines. The lung is being investigated as a possible site of RA initiation. Systemic inflammation of RA may contribute to depression. It’s exciting that through the RPF, people actually living with the disease have the opportunity engage with health care professionals at their scientific meeting. Such interaction is critical for advancing research and ensuring the best quality care and treatments. Read more from Andrew on his blog – click here. Rheumatoid Awareness Day is just a week away – February 2. This year patients and organizations across the U.S. and in other countries are observing the second ever awareness day for RD. For updates on RPF sponsored Awareness Day events – click here. 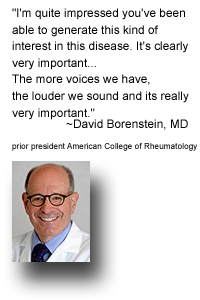 Click here to learn more about Rheumatoid Awareness Day, February 2. October 22, 2013 -- The Rheumatoid Patient Foundation (RPF) announced today that it will be presenting two abstracts with compelling findings on the nature and assessment of rheumatoid disease at the 2013 American College of Rheumatology (ACR) / Association of Rheumatology Health Professionals (ARHP) Annual Scientific Meeting, to be held October 25-30 in San Diego, CA. The data, which was collected through large surveys of patients with rheumatoid disease, will be presented by RPF founder and president, Kelly Young, and abstract co-authors in two poster sessions. Details about each of the poster sessions can be found below. 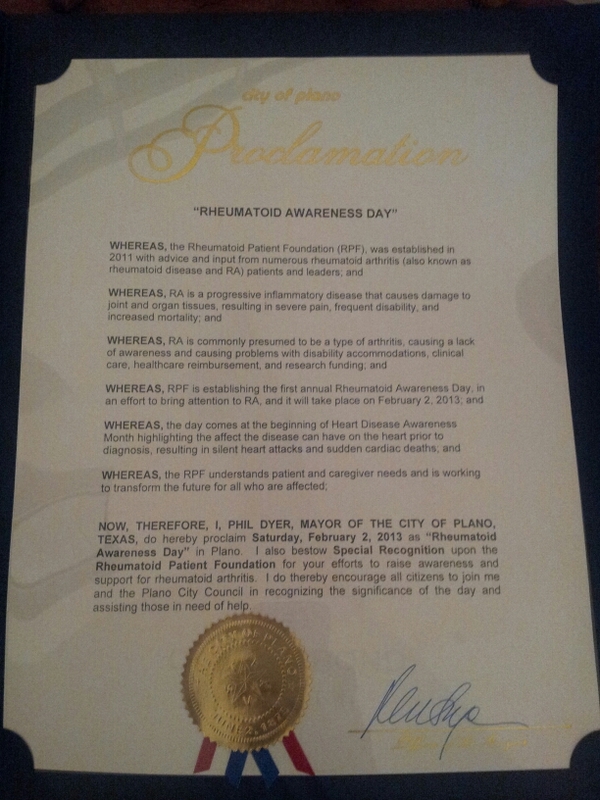 Several people in our community have shared stories with RPF recently about their own advocacy efforts and contact they've had with government officials in light of the newly established Rheumatoid Awareness Day. We want to share their inspiring stories as encouragement to others who want to join in advancing the cause of rheumatoid patients through advocacy activities. Click here for some basic tips about patient advocacy or here to see example letters. My favorite quote is by Margaret Mead, “Never doubt that a small group of thoughtful, committed citizens can change the world. Indeed, it is the only thing that ever has.” Therefore, I live my life being involved in things in my community that I hope are making a difference – alcohol and drug abuse prevention, neighborhood work and kid-serving organizations. Being diagnosed with rheumatoid disease (RD) was a complete surprise to me, as the onset came quickly after a surgery and was fast and furious. I found that some of the things I loved being involved in I had to give up, but the connections made through that involvement set the stage for me to be able to promote awareness of rheumatoid disease. 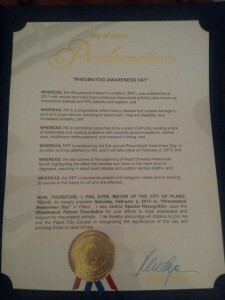 I was thrilled when I saw the press release about Rheumatoid Awareness Day! I knew this was an opportunity to start a conversation about this disease in Central Wisconsin. Because it is one designated day, I decided that a proclamation by the Mayor of Wausau was the best way to start. I looked online for other proclamations to see how they were worded. I then went to the RPF website and RAWarrior website to pull out the most important pieces of information on rheumatoid disease and put those golden nuggets in the proclamation format. With the “work” already done, I contacted the Mayor’s secretary via email and asked her what is necessary for the Mayor to sign a proclamation. I already had an established relationship with both her and the Mayor from prior neighborhood work, but you can make this type of contact without a prior relationship, as well. She explained to me that proclamations are signed in by the Mayor at a city council meeting – even better than I had hoped! She put it on the next council agenda, February 12, 2013 and said I should plan on being there for him to read it and sign it! She was grateful for the fact that all she had to do was print the proclamation on the paper they use for them. Notice the date was after February 2nd? I didn’t let that discourage me – this is about awareness and though the timing wasn’t perfect, it was a huge step forward. David Biundo and I were able to attend the meeting and were called forward when the Mayor read the proclamation. There were some pretty surprised faces in the crowd when they heard some of the information about RD. 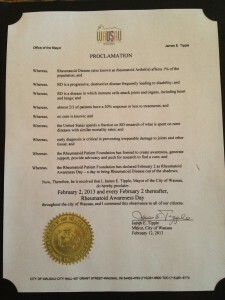 We received a beautiful copy of the proclamation and from 2013 on, in the City of Wausau, WI, February 2nd is declared as Rheumatoid Awareness Day! 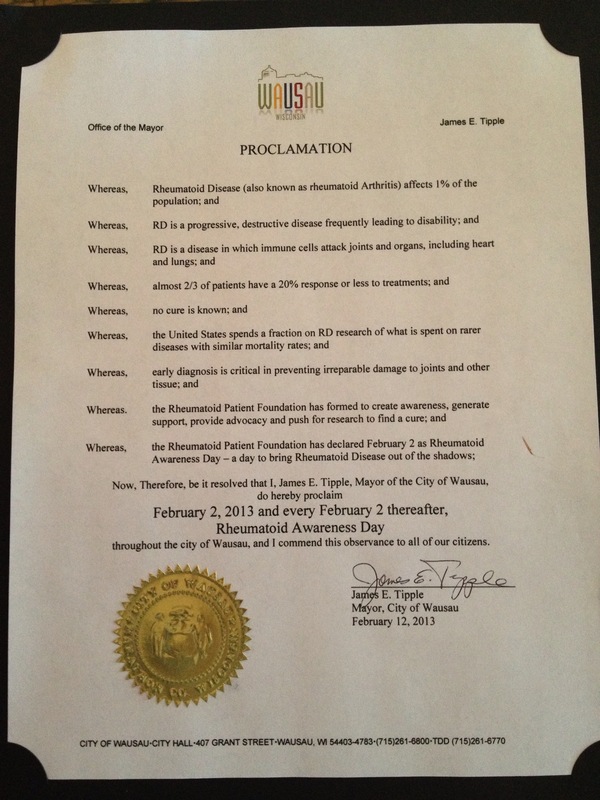 Throughout the city of Wausau, and I commend this observance to all of our citizens. Just before the first Rheumatoid Awareness Day, the Rheumatoid Patient Foundation (RPF) released the Rheumatoid Disease awareness ribbon. We had a great response. Many of you have used the ribbon in many ways including on social media via Twibbon or at local awareness events. Here's a lovely RD awareness ribbon that you can wear! 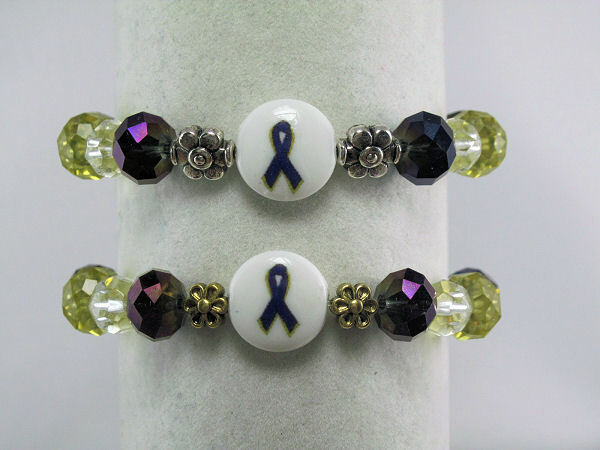 RPF member Paige Wright has created bracelets, earrings, and keychains out of the Rheumatoid awareness ribbon in her handmade jewelry store called Wright at Home Crafts. She has decided to donate 5% of the proceeds of all of her sales to the RPF. Thank you so much Paige! You can get your Rheumatoid Disease awareness jewelry here and Paige's other handmade disease awareness items.